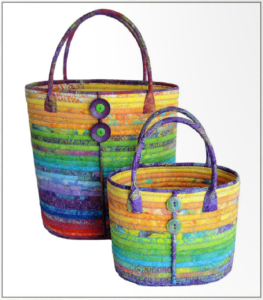 Camden bags and bowls – all made from the Island Batik Surf Squirt Collection! Camden Bowls and Bags (Aunties Two Patterns) are made with Strip Packs, (40 2 1/2″ x W.O.F. Strips – in 20 different colors) and Duet Fuse II Double Sided Fusible Batting 2-1/4in. 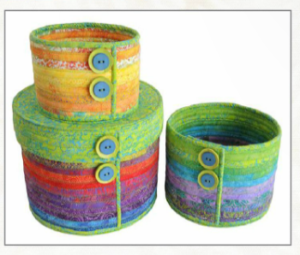 This fun technique lets you easily create these marvelous bowls or bags. They are pictured here in the Surf Squirt Colorway – but choose from lots of different options to match your taste and home decor.